If ever there was an event designed to showcase bike riding, it’s Earth Day. What better way to demonstrate you care about the health of the planet than by utilizing an emissions-free, ultra efficient, low maintenance form of transportation? From an environmental perspective, the bicycle has no peer. As a company filled with diehard bike commuters, we walk the talk every day at Seven. We view ourselves as part of the environmental solution, both in the products and services we provide, and the way we run our company. We actively take steps to reduce waste and minimize our ecological impact wherever possible, while still creating a rider experience that is uniquely yours. Now we have challenged ourselves to do even more in support of these beliefs. We examined all aspects of our business, and came up with a limited edition bike to commemorate Earth Day on April 22, 2009. We start with the Muse frame, which uses our Integrity 325™ straight gauge titanium tubing. Titanium is a superior material choice, as it offers an excellent strength to weight ratio, corrosion resistance and durability. The tubeset requires no painting or tube butting, reducing resource and energy consumption. Next, we use sandblasted graphics on the frame rather than traditional adhesive decals, in order to limit resource use. In addition to the standard graphic placement, we include a sandblasted Earth Graphic on the front of the head tube. We have increased our already strict standards for energy and resource reduction in the making of these bikes. Many processes that require significant power usage will be performed using manual labor. This creates a 25% reduction in energy costs. A team of artisans who commute exclusively by bike will handle all design and fabrication. When ready, the bikes will ship via FedEx Ground in a reused box and packing materials. First we picked Seven’s titanium Tiberius bar, titanium stem and new titanium seatpost to offer components that are built to last and constructed expressly to meet your fit and performance needs. These parts offer a lifetime of reliability, comfort and beauty. 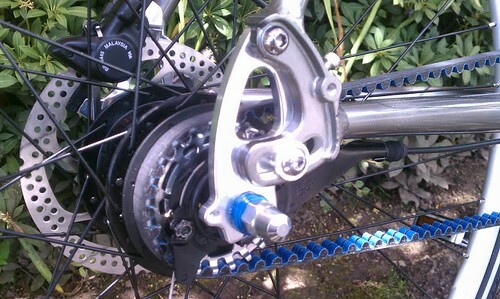 Next, we chose the Carbon Drive™ belt drive option for the drivetrain. 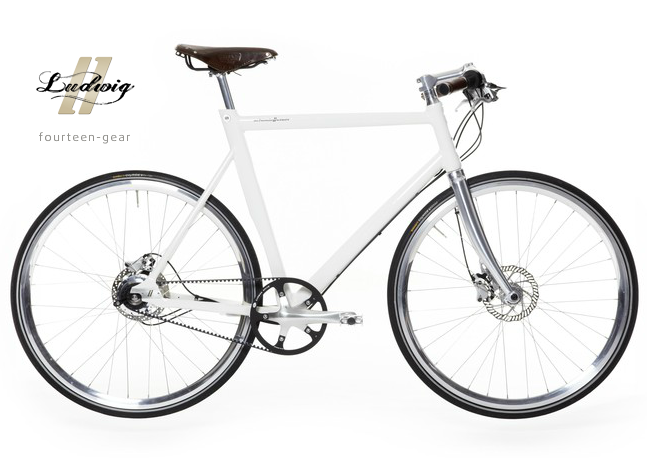 This design leverages technology from the motorcycle and automotive industry to produce a strong, longwearing belt and cog system in place of the traditional chain, derailleur and cassette system. This quiet one speed setup has fewer parts, requires no lubricants or maintenance, and performs well in all weather conditions. We opted for Chris King™ components for the hubs and headset due to their reputation for quality, long service life, and commitment to environmental manufacturing processes. We also added a No Tubes Road Kit with the rim selection to eliminate the need for tubes. To add a final touch, we have outfitted the bike with Sykes wooden bamboo fenders. Bamboo is a sustainable, renewable resource, and the fenders are biodegradable at the end of their lifespan. These equip you to look good while riding year-round. Lastly, anyone who purchases a limited edition Earth Day bike will receive a free one-year membership to Earth Day Network and a subscription to their publication E-Magazine, a $35 value. 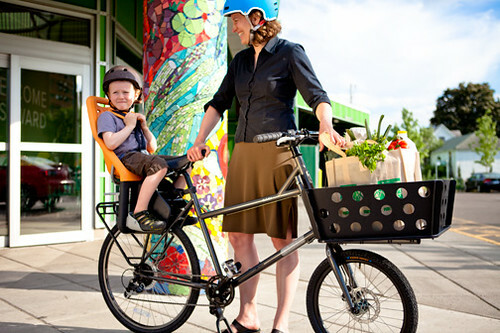 We have also committed as a company to commuting 7,000 miles by bike for every Earth Day bike sold. The average American commutes 7,000 miles by car annually, using 350 gallons of fuel. Show your commitment to the planet every day with a bike that helps you lead a more examined life. Because research published yesterday suggests that when cyclists ride in dedicated lanes motorists give them less room. Teams at Leeds and Bolton universities, supported by CTC, the national cyclists' organisation, put a camera on the back of a bike being ridden along three roads in the north of England. Analysis of the footage revealed that drivers gave up to 18cm (seven inches) more space to cyclists on stretches without cycle lanes. The findings question the perceived wisdom that slapping down strips of green paint and white lines makes riding safer. [Editor's emphasis] And as cycling continues to enjoy a boom, the suggestion that cycle lanes could be endangering rather than protecting users highlights increasingly fraught relationship between riders and drivers. Cycling is booming like never before. In the capital alone there has been a 91 per cent increase in the number of cycle journeys since 2000 as commuters ditch gridlock and delay in favour of fresh air and exercise. But not everyone's prepared to take to two wheels. "The main barrier stopping as many as two-thirds of the people who don't cycle regularly is a fear of traffic," says Chris Peck, CTC's policy chief. "While cycle lanes can have a positive effect, bad facilities only make those initial excursions terrifying, putting people off altogether." Vehicular cycling (also known as integrated cycling, integrated traffic cycling, cooperative cycling, and bicycle driving) is the practice of riding bicycles on roads in a manner that is in accordance with the principles for driving in traffic. The phrase vehicular cycling was coined by John Forester in the 1970s to characterize the style of cycling utilized in his native country, the United Kingdom, in contrast to the deferential-to-cars style of cycling and practices that he found to be typical in the United States. In his book Effective Cycling, Forester contends that "Cyclists fare best when they act and are treated as drivers of vehicles". Forester's book is generally considered the primary modern reference work about vehicular cycling, along with Cyclecraft by John Franklin, which is part of Bikeability, the UK's national standard for cycle training, andBicycling Streetsmarts by John S. Allen, a compact tutorial also published in custom formats including as bicycle driving manuals for some states. Ride4Autism is Saturday April 28th, 2012. 2012 registration is OPEN! Join us Saturday April 28th, 2012! The ride is designed for novice to expert riders. There are 3 routes to choose from ranging in 10, 30, and 75 mile increments as well as two "unsupported" shortcuts with a total of 45 miles or 60 miles in length. Register today for only $35 and you receive a complimentary t-shirt and raffle ticket for a chance to win a brand new 2011 Giant Cypress ST donated by GIANT.Register today!. Want to help but don’t want to ride? No problem! Our idea is that nobody can do everything but everyone can do something. We understand that not everyone can ride and without volunteers this would not be possible. Rather you are checking riders in, refueling riders at the food stops or just flat out sponsoring the event there is something for everyone to contribute. Learn More. If you appreciate the bike trails in Fayetteville, but you find yourself driving more often than not, you aren’t alone. Unless you live close to a trail and reaching your destination is convenient, it probably makes more sense for you to drive. Riding a bicycle is supposed to be a relaxing, joyous activity, but that ends once you have to leave the trail and ride in traffic. For casual riders, there are three criteria which a prospective ride must meet before most people will even consider using a bicycle to reach a destination: safety from traffic, general comfort, and a clear route. Trails are fantastic at addressing each of these, but what if a trail won’t take you all the way to your destination? It’s a good question, and it’s not one Fayetteville’s Alternative Transportation Plan answers. Think to yourself: what route would you ride to get from the Fayetteville High School to Gulley Park on East Township? If a clear route that connects the trails, avoids the hills, and uses side streets to keep you out of traffic doesn’t immediately come to mind, the prospect of riding can be a little intimidating. That’s a problem. Bentonville, our neighbor to the north, already has a working system of bicycle routes that makes it easy to travel to and from key locations. They have the Blue Route, the Pink Route, and Red Route, and half a dozen other named routes with signs that any person on a bicycle can follow. Ludwig XIV is in the vanguard of the Schindelhauer-Family: he shines with one ́s head held high above them all. Equipped with a 14-speed gear hub by Rohloff, the new found head truly lives up to his name. The new tourer combines in the customary fine Schin-delhauer aesthetic both freedom from maintenance of the Carbon Drive belt paired with the efficiency of the Rohloff shifting system. In spite of its features like disk brake, Brooks leather saddle and if requested splash guard, Louise XIV embodies simple elegance of his Schindelhauer ancestors. The shade of green paint used to mark the mile-and-a-half bike lane that runs along Spring Street downtown is not film-friendly, it turns out. Los Angeles has a bike plan, and it's a fine idea. We have quite enough cars and quite enough drivers, thank you very much, and the counter-stereotypical truth is that we also have thousands and thousands of bicyclists who would gladly leave the car in the garage (or not buy one in the first place) and take to the pedals if only we could make enough room for them on the pavement. That's the idea behind the mile-and-a-half or so of green-painted bike lane that runs along Spring Street downtown. By itself it's not much, but as the anchor of a bikeway network, it's an inviting path. Of course, bike lanes are nothing new, although they always seemed to work out well enough without being painted a garish color. And this green is just so, well — green. Kind of a gimmick, right? But whatever. It's not like it does anyone any harm. A well-meaning friend said this to me yesterday. A day later, I have figured out what I should have replied. Better late than never, I guess. Good thing this fellow was in newspapers, not in the investment advice business. The messenger industry in New York City is a serious — if not dead serious — multi-million dollar business. Running in and out of bumper-to-bumper city traffic or hopping on and off subway lines to crisscross the city during rush hour requires some skills when you’re on a bicycle. I’ve been writing about messenger life for the past 10 years. Through this work, I have interviewed a number of bicycle messengers about their thoughts on the city’s new bike lanes. Bicycle messengers have always been scrutinized for how they ride in traffic. The police keep a keen eye on messengers and give them tickets for violating the law. One of my fellow messengers quit being a bicycle messenger because he had too many tickets. Now I see him on the streets doing messenger work on foot. In the last five years, the city has designated a lot of streets for bicycle lanes. These new bicycle lanes have created quite a controversy, usually between bicycling advocates who support the lanes and motorists who stand in opposition. But all us bicyclists don’t stand together. Most of us bicycle messenger don’t like the new lanes at all. We prefer to ride with the flow of traffic. This 143-km (89-mi.) 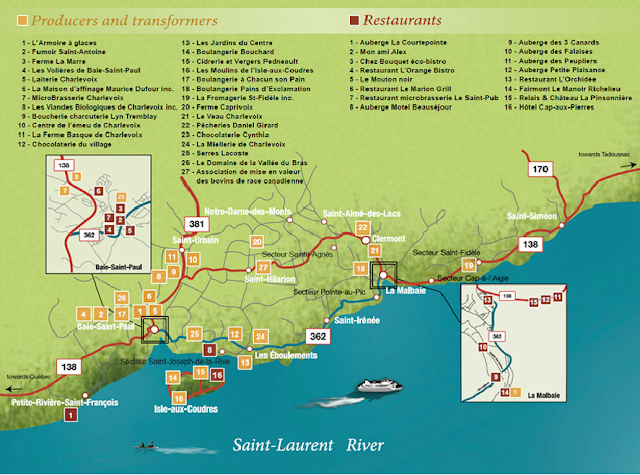 route is born of an alliance between farm producers and restaurant chefs in the region eager to highlight products from the fertile fields of Charlevoix. Members work in close cooperation to grow, process, prepare and feature products from the Charlevoix region. Visit the Web site for full details and a map of the route. Charlevoix’s unique products and dishes are the result of a lengthy process that involves producers and transformers. Production and transformation of local Charlevoix products is done in genuinely traditional fashion. Many of the local flavour Craftspeople have been practicing their art for several generations. Dozens of enthusiasts develop local products which inspire even the most demanding Chefs’ creativity. Thus, and for over 10 years, the region’s producers and transformers have pooled their knowledge to make Charlevoix a reference in Québec’s farm produce industry. 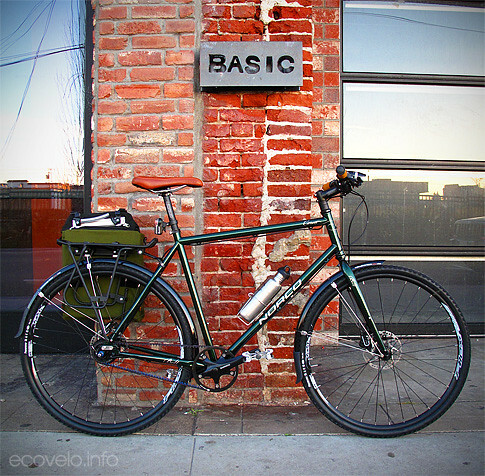 Welcome to Joe Bike, a full-service retail and repair shop that specializes in the most advanced, most dependable, cleanest, most practical, and lowest-maintenance urban bikes available, equipped with Gates Carbon Drive, the best internally geared and dynamo hubs, and hydraulic or mechanical disc brakes. in The Michigan Hall at COBO Center. Detroit Bike City is Detroit’s first annual bicycle show and swap meet. Offering 100+ vendors from all over the Midwest the opportunity to show, sell and swap bicycles, parts and everything bikes. Bringing together the whole community with all forms of bicycles from road and racing to mountain and BMX, Detroit Bike City has something the enthusiast or casual rider can enjoy, plus a full day of bicycle activities and demos for the whole family. A real chance to get some great deals, be sure to come out to Detroit Bike City to buy, sell, swap and browse. Individuals are welcome to bring in small items for trade i.e. a hub or pedals (anything other than complete bikes, frames/sets, or wheels) at no additional cost to admission. Individuals wishing to sell and/or swap complete bikes, frame sets, or wheels please refer to the vendor information packet. Email: thorst@diabetes.orgFor more information, call 614-436-1917 ext. 6622 orContact Us. Many people will participate in the Tour de Cure for the stimulating competition, camaraderie and physical cycling challenge, but the real reward comes in knowing that every mile we ride and every dollar we raise brings us that much closer to stopping this disease that affects nearly 26 million Americans. Be one of more than 50,000 riders nationwide committed to helping us Stop Diabetes! From coast to coast, in over 43 states, the Tour de Cure is changing the future of diabetes! Ohio Bicycle Federation is fighting for cyclists in OHIO! Check out their advocacy efforts. The Ohio Bicycling Federation has the following proposals and informative articles available. Note: Most will open in a new window that will be re-used if you open another article. We have proposed a series of Ohio Bicycle Law Reforms. These are also described in a 12-page booklet that can be given to lawmakers. We have written a Digest of Ohio Bicycle Traffic Laws that summarizes the laws and explains what they mean. For those with an interest in researching other aspects of the Ohio Revised Code, you can search it electronically. We have a new Bicycle Transportation Policy Statement to promote best practices, based on education for safe and effective bicycle transportation planning. This is suitable background information for those involved in local advocacy to present to planning boards and government agencies. We have also prepared a general article on Improving State and Local Cycling Lawsthat describes our advocacy work and seeks cooperation with cycling organizations in other states. Proposed Driver Test Questions to improve the level of knowledge about bicycle operation, safety and traffic law. "Bicycle Friendly" has become a buzzword, but what is important is treating cyclists fairly and encouraging the best and safest practices. Many of the most important measures to help cyclists cost little or nothing! Cyclist Friendly Communities Program includes a complete toolkit for improving conditions in your community and information on qualifying for this new award. Guidelines for a "Cyclist Friendly Community" has lots of practical tips to make your city "friendly" to cyclists. To celebrate Columbus’ rich and talented community of musicians, the Celebrate Columbus in Song contest invited Columbus musicians to submit original songs inspired by Columbus. The contest had an overwhelming response. The initial 123 submissions were narrowed to the list of 29 songs below by a panel of community members who considered adherence to the contest rules as well as other song characteristics including relevance, musicality and overall vibe. Celebrate Columbus in Song is designed to support local artists as they support the Bicentennial and for everyone to celebrate and enjoy the city's amazing creative talent. The top 10-12 songs receiving the most votes will be featured on the CD, along with the Columbus Bicentennial Anthem, written by Milton Ruffin, the principal of Ft. Hayes High School. The musicians/bands selected will receive a cash prize of $500 and an opportunity for professional recording and production time at the WCBE-FM or Jazz Academy studios. Performance opportunities at select Columbus events and festivals during 2012 will be provided as well. Ready for the job. Without a big truck (he uses a cargo bike and a large trailer), Chris Sanderson is finding a niche with his construction business. Chris Sanderson, the man behind new bike-based business 'Builder by Bike', is a licensed general contractor who wants to show it's possible to be a home remodeler, deck builder, and painter, without owning a big truck. "There's a real macho thing in this business with trucks," he said during a brief stop at my office last week, "But I'll see them drive away from the hardware store with 2-3 two-by-fours!" That size of load is nothing for Sanderson, who has a massive Bikes at Work trailer and a sturdy Yuba Mundo cargo bike in his work fleet. Both set ups can carry up to 400-450 pounds of materials and equipment. About 2.5 times the size of a standard-issue EcoTote (big enough for one of Farmer Pete’s prize-winning watermelons). Main compartment contains three large shelved pockets that unhook to create a full cylinder, plus an interior change pocket. NEW! Top rolls up like a dry bag and secures with a tough Velcro strap. NEW! Made of water-resistant cotton canvas + a Cordura Nylon liner for extra protection. NEW! Super-bright interior makes finding your stuff easier. NEW! Other goodies: reinforced bottom, blinding reflective strips, utility loop, padded shoulder straps, adjustable chest buckle. One of the very few products we make outside San Francisco (specifically, China).